March is almost at its end, so that means that it's time for Microsoft to announce the 4 new games that will be making their way to the Xbox One, 2 of which will also be available on the Xbox 360. I honestly believe that this month is one of the best yet, with all of the games being well known and a few of them even being AAA. If you haven't already, remember to grab the renaming two games from this months Games with Gold promotion, Lords of the Fallen and Borderlands. The first two games we will be getting are The Wolf Among Us and Dead Space on the Xbox 360. The Wolf Among Us is one of the more popular games published by Telltale. It's another one of their episodic adventure games which we have come to know and love. 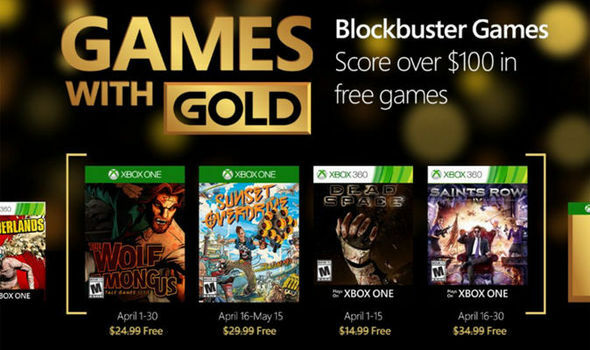 You can pickup The Wolf Among Us starting April 1st going all the way through until April 30th. Dead Space is a third person shooter with a sci-fi/horror theme to it. It was released back in 2008 so it's fairly dated. You can snag Dead Space between April 1st and April 15th. The two games we will be receiving in the second half of the month are a bit more exciting in my opinion. Gamers will be able to enjoy Sunset Overdrive and Saints Row IV on the Xbox 360 during the second half of the month. Sunset Overdrive was a highly anticipated Xbox One exclusive back in 2014. It is played as a third person adventure style game and has seen great success since release. You will be able to pickup Sunset Overdrive in between April 16th and May 15th, so you actually get some extra slack in case you forget to download it. Saints Row IV will be available to Xbox One and Xbox 360 players. It plays as a singleplayer/multiplayer adventure and free roam game with a decent open world. You can grab Saints Row IV from April 16th to April 30th. What do you think? Do you like the selection of games this month? What games are you going to download? Leave your thoughts below! God, RaoulDuke, LookBroZombies_XBL and 3 others like this.